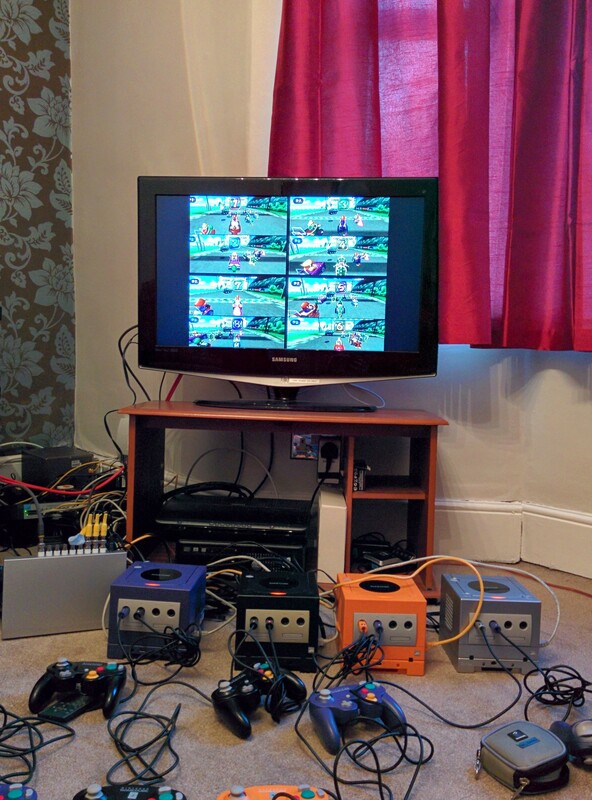 Nintendo GameCube LAN: 8-Player Mario Kart: Double Dash!! Mario Kart: Double Dash was and still is a must have game for any Gamecube fan, released in 2003 it was the follow up to the N64 game Mario Kart 64 and it added some interesting new features like Co-Op play and double items. 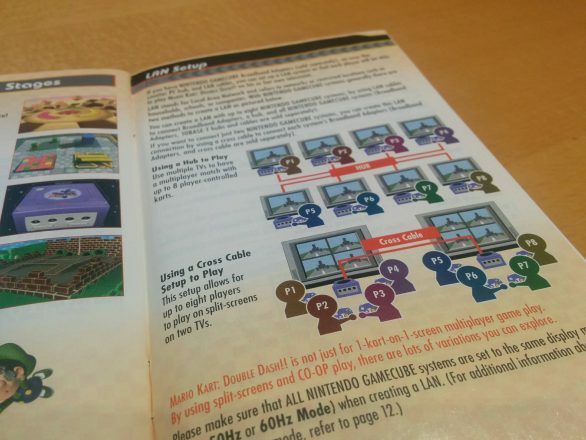 But what most people don’t remember or never experienced was LAN MODE, LAN is an acronym of Local Area Network, This option only appears when you have the Nintendo Broadband adaptor installed in your GameCube. With this extra hardware you can now connect up multiple GameCubes each with its own copy of the game and its own Broadband adaptor, presumably you were supposed to take your cube to a friends house to link up your systems as there was no built in way to play over the Internet, nowadays you can use software on your computer to achieve this but I’m not interested in that. 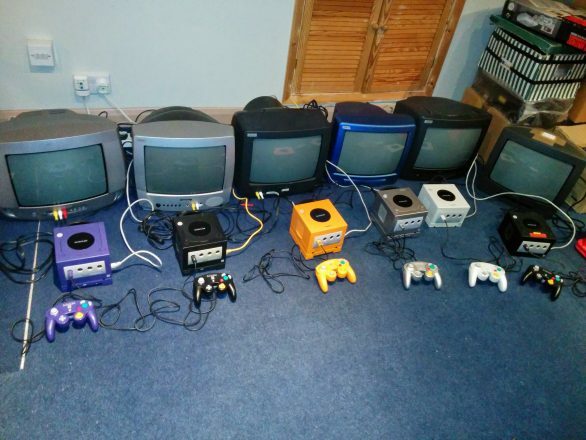 I wanted to create the ultimate Local Multiplayer Mario Kart: Double Dash setup, partly because of how strange it seemed for this to be included but also because I already had a bunch of GameCubes from another project and I wanted to justify the expense by spending more money, that makes sense right? 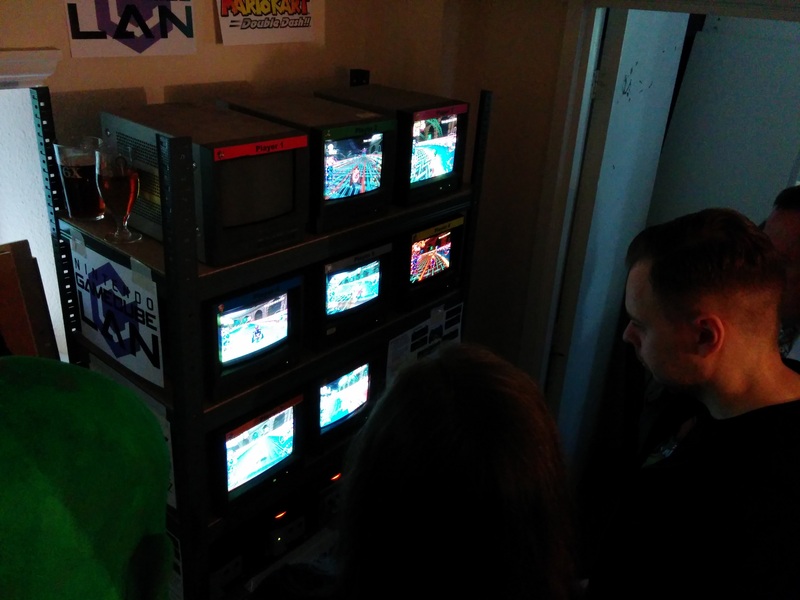 I started off with just 4 GameCubes using Split Screen to achieve the 8 player setup, to make testing easier I have all the GameCubes connected to a CCTV box so I can see all 4 GameCubes on one screen, unfortunately it’s too laggy to play it this way. Further testing this time with 6 machines, I had arranged to bring this set up to a convention and some of the components would need to be collected on the way. Somehow I managed to buy the necessary parts on eBay and arrange to collect them on the day I was travelling. 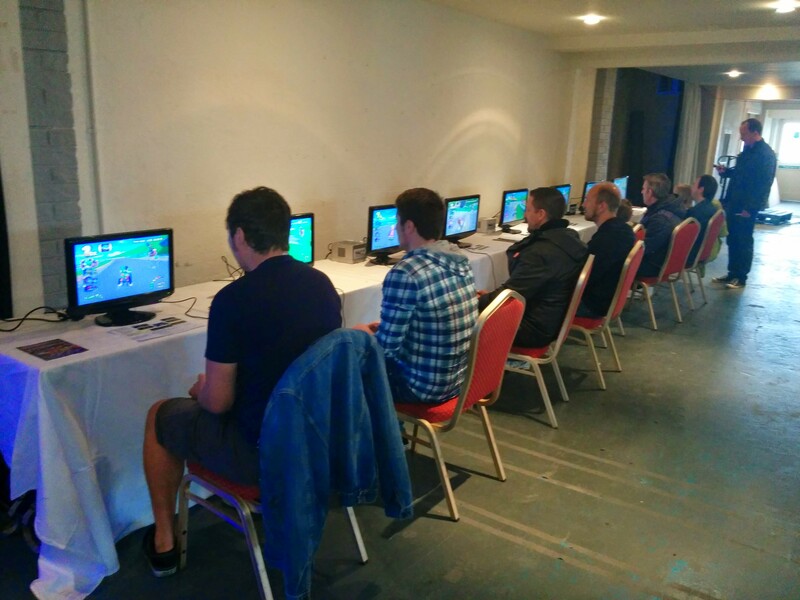 The Final setup was shown at Play Blackpool in May 2015, where it went down very well, I wish we had had a bit of signage to say what it was but once people understood what it was it became a popular part of the event. This is where I discovered that the LAN game does have it’s limitations, you can’t choose your character, only one person has control of the game, if one system goes wrong or gets reset it kicks everyone out and if somebody stops racing the game doesn’t finish until they cross the finish line. That was all fine for a nice big convention but what about on the smaller scale where space is at a premium. I discovered the wonder world of PVMs or Production Video Monitors, these high quality CRTs came in various sizes but the ones I was most interested in were the 9 inch variety. 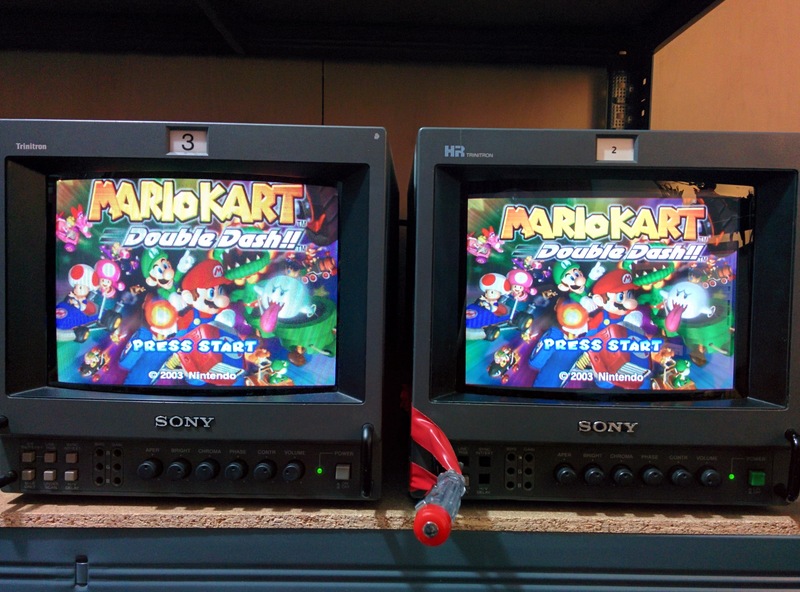 With enough of these dinky CRTs I could run the same set up in a much smaller space, on my way to Retrovision, Oxford in March 2016 I took a slight detour to London (it was only 100 miles out of my way) I again manged to pick up an eBay purchase of 8 of these 9 inch CRTs to run my setup. Unfortunately one of them turned out to be faulty so we only had 7-player Mario Kart but even so it worked fairly well in the small space. 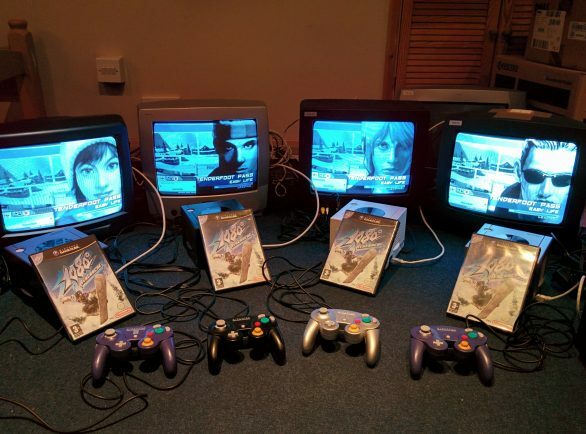 After all that you’d think this would be the end but no what good is a Nintendo GameCube LAN setup if it can only run one game, it would seem that only two other English games were released with LAN functionality. 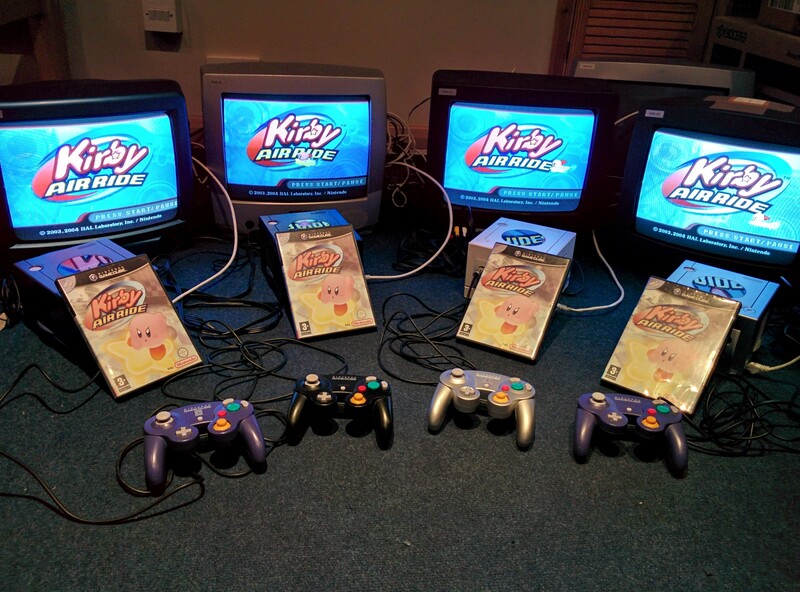 All 4 of my copies of Kirby Air Ride are not English, I have one Dutch, one French and two Spanish, as it was too expensive to get the English version and the game plays in English anyway. This makes my collection of English LAN GameCube games complete, keep an eye out for announcements of future events so you can check this out for yourself. I am the creator of Illegal Toothpaste and the main contributor of content to the site.No information is provided by the author.